Fabio, the World’s Greatest Flamingo Detective is back in a brand new book, Mystery on the Ostrich Express! 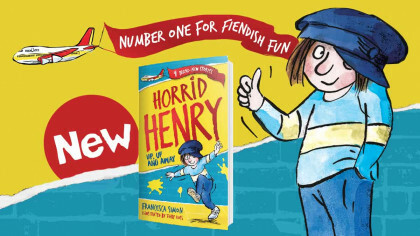 When a priceless ruby goes missing on the world’s fastest train, Fabio is on the case! Fabio the Flamingo is back in his sequel to Fabio the World’s Greatest Flamingo Detective: Case of the Missing Hippo! In a small town on the banks of Lake Laloozee lives the world’s greatest flamingo detective. He’s not tall or strong, but slight and pink. And he’s very, very clever. The second story is called Fabio The World’s Greatest Flamingo Detective: Mystery on the Ostrich Express! In the story, it’s the height of summer and Fabio and his associate Gilbert are taking a relaxing holiday journey on the fastest train in the world! But no sooner does the conductor call ‘All aboard’ than a very expensive ruby necklace disappears and the great detective is back on the case! 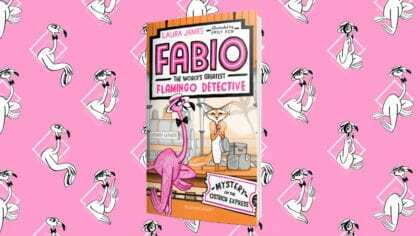 Fabio The World’s Greatest Flamingo Detective: Mystery on the Ostrich Express is the second book in the hilarious illustrated mystery series by the author of Captain Pug.